Are you looking for something to pick up seeds and nuts in your yard, retrieve golf balls on the course, gather apples in your orchard? Designed with your needs in mind, the Nut Wizard® tool may be just the solution you need. Relax your muscles as you operate it with little or no force. Use a handle that fits your height so you never have to bend over. Invest in a tool that is durable and made in the United States, saving both your money and your back. Across Canada and United States, Nut Wizard® tools are now a household essential, taking their place next to rakes, shovels, and brooms. 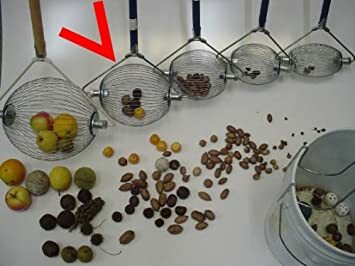 The Nut Wizard® is also known as a nut gathering tool, nut gatherer, nut picker, nut roller, gum ball picker, nut picker-upper, basket nut tool, nut grabber, yard roller, walnut roller, walnut tool, nut tool, lawn sweeper, walnut rake, lawn whisk, nut collector, acorn rake, sweet gum ball rake, acorn gatherer, acorn picker upper, pecan picker upper, walnut picker upper, pecan retriever, hazel nut picker, beech nut, and pine nuts..
Nut Wizard® tools come in six sizes, with each size suited to gather a specific size of nut or fruit. To choose the correct size, measure the diameter of the nuts, seeds, or other items you have to pick up. The Nut Wizard® tool that picks up the smallest of these will work for most everything, although it will pick up the larger objects in smaller quantities. If there is a great variance in the size of objects you wish to pick up, consider ordering a combination of sizes. Includes the complete tool with a 4' wooden handle and one unloader. Includes the complete tool with a 4’ wooden handle and one unloader. Recommended for beech nuts, edible nut pine nuts, bolts, nails. We are able to ship up to 5 units in one container to reduce shipping costs. Do not ship to the United States.